Editor's Note: Editor's Note: This is the first installment in Teton Gravity Research's new series "Indie Ops." In this series, we're talking with the people behind the independent brands in the outdoor world, from skis to hard goods and accessories to camera equipment. The ski industry is changing, and Sego Ski Co. is ready to take advantage of it. 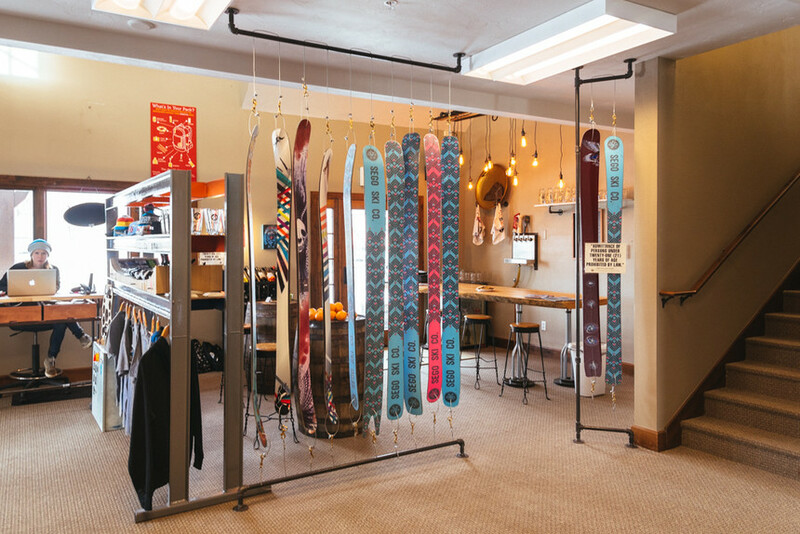 Sego is poised for wild growth in a changing industry: In just four seasons they’ve gone from making 200 to 600 to 1,000 to 1,800 pairs of skis–and they’re not slowing down any time soon. In idyllic Teton Valley, Idaho, Sego is churning out skis year-round. Their employees have grown from three to twelve and they’re looking to hire more. They’ve got about a dozen athletes on their roster and over a hundred people repping their skis ‘round the world. If there’s a ski brand to watch right now, it’s Sego. I caught up with Tim Wells (½ of the founding duo), Alex Suckling (sales) and Tana Hoffman (marketing) at their new office space just down the street from my house in Victor, Idaho. With one of the best big-mountain test zones out their back door, Sego can lay up a prototype and test it in the same day and start working on the next prototype as soon as it comes back in. Sego’s goal is to build a ski for anyone that likes to have fun on the mountain, and they’re doing just that. This year’s line has 16 models, from groomer crushers to fat sticks that’ll be your best friend on a powder day. Next year, they’re expanding the line to 21 models. Here's what goes into a pair of Sego skis. Ski builder Tyler Nelson shows off some fresh ski cores. Katie Cooney photo. From start to finish, there’s heart and soul in every Sego ski. 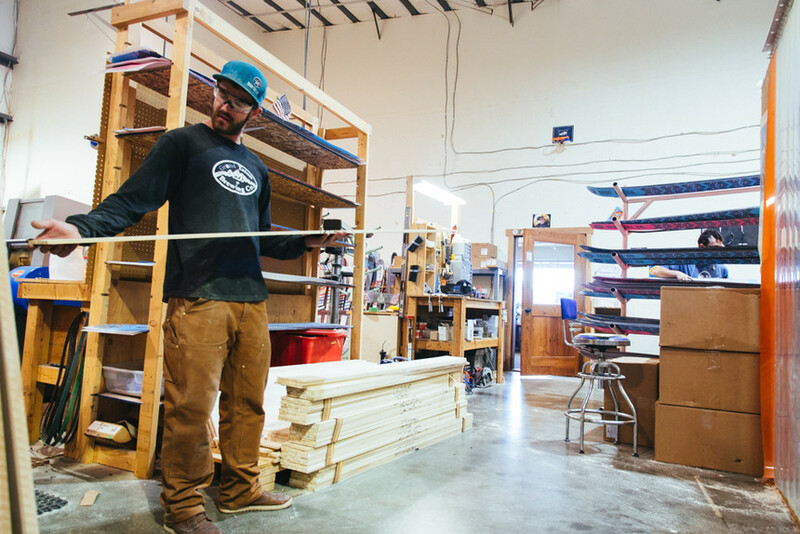 They’re built entirely by hand in Sego’s Victor, Idaho factory with the best materials available and every single ski goes through an quality control check before it goes out the door. From their athletes to their ski builders, everyone’s got a say in the next ski. What’s Lynsey Dyer looking for in a ski? A hard-charging, directional ski that can rip big mountain lines in Alaska. With that in mind, Sego made the UP AK, a fully-rockered ski that can handle the deepest of days, but still be a ton of fun if the snow’s not perfect. 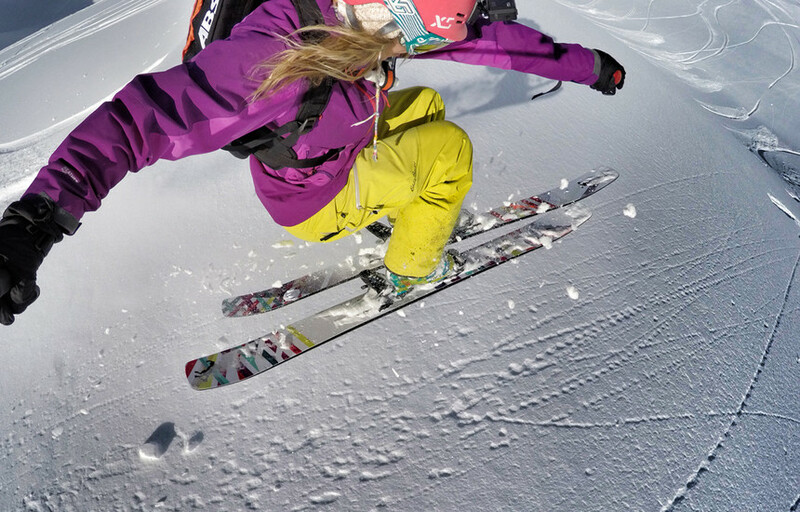 Sego doesn’t just shrink a ski and call it a women’s ski–they’re truly independent models, and they’re ready to take the freeride world by storm. Sego is perfecting the balance between overly artistic and totally boring skis: They’re elegant and fun to look at, but most importantly, they rip. You won’t see new graphics from them every year, but that’s a good thing: Sego is hell-bent on maintaining their core values, one of which is not discounting skis. By carrying the topsheets for two years, they’re being good business partners for the people that sell their skis. If a ski doesn’t sell, the retailer doesn’t have to slash the price of the ski. “We’ve seen a handful of companies get in trouble when they lose their price integrity, and we’re not going to do that,” Tim told TGR. 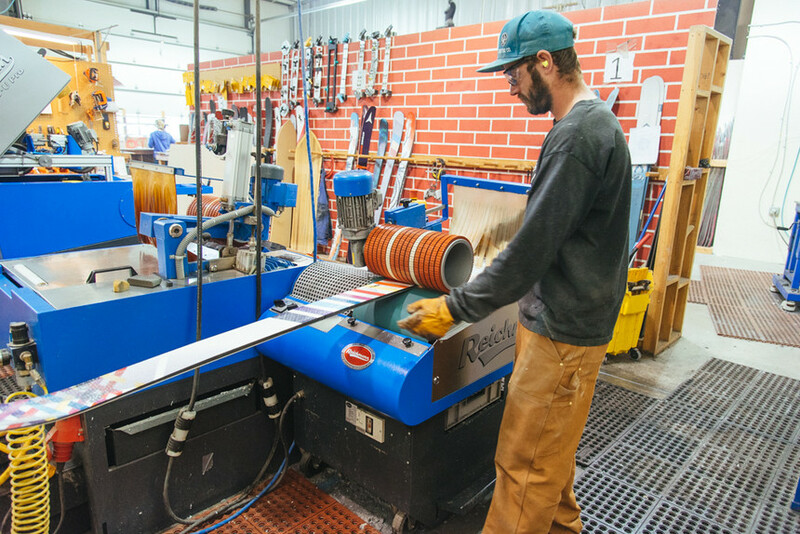 During peak building season (summer), they’re churning out an average of 17 pairs of skis per day. Next summer, they’re hoping to make 20-25 pairs per day. TGR: What makes Sego an awesome place to work? Sego's new bar/showroom combo in Victor, ID. Katie Cooney photo. Tana: Did you notice the bar when you walked in? Alex: That doesn’t hurt. We’ve got a bar downstairs with four beers on tap, including a Sego branded beer that we created with Roadhouse Brewing. Beyond the libations, Sego’s got a ski bum friendly powder clause: If there’s more than 8 inches in 24 hours, we want you out skiing. TGR: How many athletes are you working with right now? Sego athlete Lynsey Dyer ripping on her Gnarwhals. Courtesy of Sego Ski Co.
Sego’s got athletes like local legend Mark Ortiz, who, up until last year, didn’t have social media. On paper, he’s not the perfect athlete for a big company to go after. 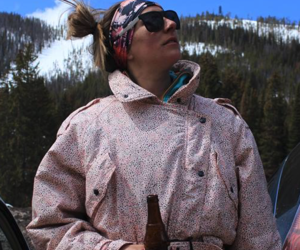 But Sego wants to connect with the pro-amateur realm of skiers; people who are still living the ski bum lifestyle that so many are attracted to right now. Ortiz recently put out a short documentary about his quest to fulfill the Idaho 12er project that was selected for Winter Alliance’s 2017 Backcountry Film Festival. TGR: As a company, what makes Sego unique? If it's dumping in the Tetons, the Sego crew will be out shredding. Katie Cooney photo. Beyond their dedication to their retailers and their customers, Sego does its very best to be a good steward of both the environment and their community. “We try to participate in the community as much as we can,” Tana told TGR. “We want people to feel like we’re a part of the tight-knit Teton community; we’re not just squatting here.” From donating to local charities to throwing hot dogs at the crowd during the 4th of July parade, they’re a part of it. Sego’s high-end materials are sourced as environmentally friendly as they can be, and when you hop on a pair of Segos, you can rest easy knowing that the person who made them is making a fair wage (we think that’s pretty rad). DID WE MENTION THE GIANT BLUE BUS? 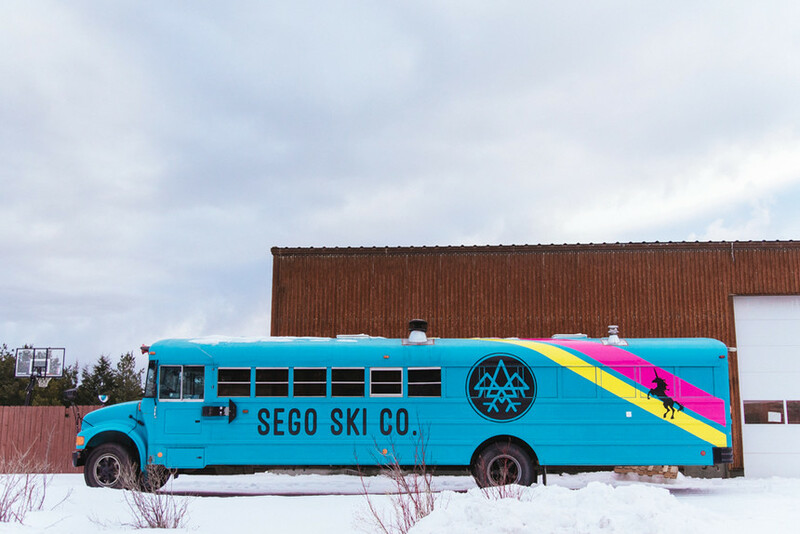 The Sego Ski Co. bus in all of her glory. Katie Cooney photo. In the coming seasons, Sego is looking to expand into the European market and beyond. They’ll keep making more skis, and if nobody stops them, they'll take the Freeride world by storm. As for the immediate future? What'll be new next season? Sego gave us a big, fat hint: keep your eyes peeled for the Condor TI, a big-mountain backcountry ski made to handle everything from wind buff to crusty pow (it certainly won't hurt that the topsheets will be matte black with a sweet little avocado). If you want to keep up with the Sego Ski Co. crew, check them out on Facebook and Instagram. They’re probably bringing the bus to a mountain near you! This company has never built that many skis over the last 4 years. Those numbers are false. Not blaming the author, maybe whomever she interviewed was a liar? Not often you can say you shook the hand of the guy who built your skis! Hey Tyler, thanks for the demo. Looking forward to my new skis. I love reading about companies that are approachable and the passion for their sport seeps through in everything they do. Can’t say enough good about SEGO ski! Very nice article, a great read!